Although deafness is not a defect that is seen in the Rat Terrier breed, should this tragically happen to anyone here are some quidelines for training. Training a deaf dog is challenging and takes patience, but it can be rewarding for both you and your dog; it will also improve your dog's life. 1. Bend your arm at the elbow (at a 90-degree angle) with your hand held open, palm facing up. Slowly raise your palm toward your shoulder. 2. Hold a tasty-smelling food treat next to your dog's nose and mouth at the same time as you give the command. 3. Keep the food treat close to your dog's nose, and slowly take the treat up and over his head. Doing so will lead the dog into a sit. 4. Let your pet nibble on the treat if he wishes, but hold tight as you lure him into position. 5. Give the food treat the instant your dog sits, and praise him by petting and making an expressive happy face. 6. Encourage your dog with treats as well as with visual and tactile reinforcement - you don't want him to give up. 1. Start with your dog in the sit position. 2. Bend your arm at the elbow (at a 90-degree angle) with your hand held open, palm facing down. Slowly lower your hand down by your side. 3. Hold a tasty-smelling food treat next to your dog's nose and mouth at the same time you give the command, as before. 4. Keep the food treat close to your pet's nose, and slowly take the treat down to the ground between his legs. This should lure your dog into the down position. 5. Give the food treat and ample praise when the trick is accomplished. When you first teach this command, start with your hand held level with the dog or just above his head. "Down" is a hard behavior to teach to some dogs, as it's the most vulnerable position a dog can be in. Be patient, and try this over and over until you both get it right. 1. Start inside the house and begin working over a very short distance (a few feet). 2. 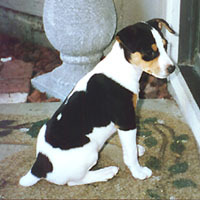 Page the dog to get its attention if you have a pager collar, or wait until your pet notices you. 3. Show a treat when your dog looks at you, and give the hand signal for "come" by extending your arm straight up. 4. Reward your dog when he comes to you. Teach new behaviors in a familiar area in the house and on a surface where the dog feels secure, but keep in mind that dogs are situational learners; after they've learned a particular behavior in the house, you have to start over when moving outside. In the beginning, reward your dog as soon as he shows any attempt to do the behavior (for instance, almost going into the down position). Build on these basic behaviors by teaching "sit," "down" and "come" at a distance. Increase distance slowly, a few feet at a time. Refer to basic obedience training manuals to get ideas for additional hand signals and their proper executions. Overall Warnings: If you think your dog has forgotten a particular behavior, he probably didn't know it well in the first place. Go back and teach the behavior from the beginning. Avoid getting angry, jerking, hitting or pushing your pet for unwanted behavior. Instead, ignore it and focus on rewarding the behavior you do want.